I remember vividly my first encounter with singers. I do not mean my mum humming the lullaby or my sister screaming some unworldly (and not in a good way) notes. I mean listening to the voice of professional singers and understanding the extent of their craftsmanship. When I discovered my own, I was always aspiring to sound as good as them, but never seemed to come even close to their level. This caused frustration and insecurity to the point where I refused to sing, on the whole. It was until I discovered that the world of perfect voice is not as transparent as it seems, that a lot of singers use vocal processors in order to sound as good as they do. Of course you have to have some potential and vocal capabilities, because these devices are not magical wands (unfortunately). However, they can make you sound better and improve your performance significantly. Whether the gods themselves gave you that ethereal voice or you are just a normal human being with good vocals, you have to have the best vocal processor. This article will give you all the information you will need and list down some of the best deals on the market, so keep on reading! There is so much to say about TC Helicon Play Electric. It offers an abundance of features and provides you with a lot of versatility. First and foremost, it can be utilized with both vocals and guitars, which makes this pedal a must-have for every solo performer. This unit has three footswitches and several buttons and knobs. Play Electric comes with the TC Helicon’s signature Adaptive Tone, which allows you to control the EQ, gating and compression. What is more, it can automatically harmonize with your guitar. The pedal recognizes the chords you play and adjusts your vocals accordingly. It offers an abundance of amp simulations (25 in total), compressions and guitar effects, including some of the TonePrint’s goodies: Flashback Delay, Hall of Fame Reverb, Corona Chorus, Vortex Flanger. The vocal effects include harmony, doubling, delay, reverb, auto tune, transducer and modulation effects. The selling point of this pedal is definitely the HIT button which allows you to add different effects to in-built or new presets (there are over 170 downloadable ones). There is so much more that this vocal processor can do, but we would need a dedicated article to list down all the features. All in all, Play Electric will not disappoint you no matter what. Even though many musicians have love-hate relationship with Boss, I, personally, appreciate the quality of their products. The price and the packaging are always in accordance with each other, which makes this brand one of the staples. 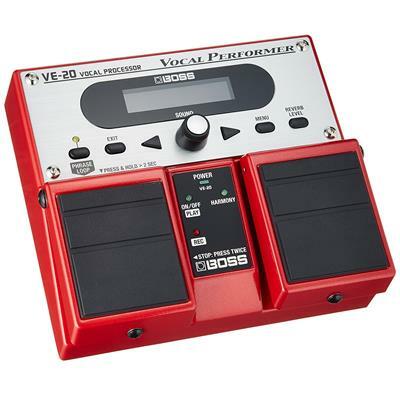 VE-20 Vocal Processor is the pedal of the same ilk. It has a twin design with 2 footswitches, couple of buttons and a knob. It offers 30 pre-recorded presets to choose from, plus 50 different memory locations, so that you can easily save your masterpieces. This unit has all the tone-shaping features as well: level, pan, pitch intervals and unison or up and down (up to an octave) harmonies. There are no dedicated knobs for these controls, except for the Reverb (with level control) and Harmonies (single press on the right cursor activates the knob and enables you to choose a key). VE-20 offers an abundance of vocal effects, including Auto-Tune, reverb, delay, distortion, chorus, flanger, strobe (a.k.a. tremolo) and more. The aforementioned footswitches have their dedicated functions: the first one activates the pedal, while the second one is set to default to switch harmonies on and off. The latter can also be set to control the effects during the patches. In short, this is a great bang for the buck indeed. 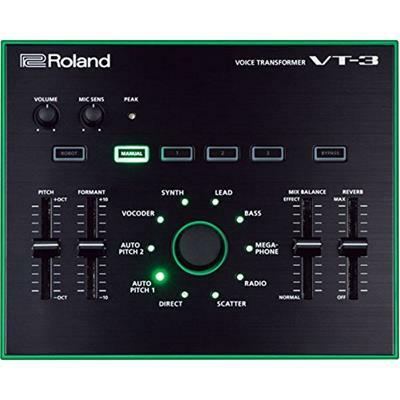 It is better to cut to the chase, since Roland AIRA Series VT-3 is steeped with features. It has a lot to offer and is way cheaper than its predecessors. Let’s start with the sliders, we have four of them here: Pitch can go an octave up or down, which makes you sound as higher or lower as you want, Formant can transform your male voice into a female one (and vice versa), Mix Balance adds some dry signal to the affected one, which makes your original sound stand out even more, while the Reverb modifies different parameters of the said effect. You can also find the Volume and Mic Sens knobs. The former modifies the level of the pedal, while the latter manages the volume of the incoming signal. Then comes the Robot mode, which, obviously, emulates the sound of an automaton. Next to this feature you will find three buttons labelled as 1, 2, 3. These are the presets that allow you to capture whatever you will create and then mix them all together. Manual knob reflects the settings of the sliders, while the Bypass does exactly what the name indicates. The star of the show here is the main knob, which enables you to choose various effects. All in all, VT-3 is a great update compared to the previous models and offers a lot of flexibility. What we have here is yet another feature-packed product from TC Helicon. It takes only a glance to “feel” the sturdy body of this pedal. This bad boy is not overcrowded with knobs, however, we have just the right amount of control here. The first knobs you will notice are Level, Guitar, FX, Harmony. Each of them modifies the parameter it indicates on, making the adjusting process a child’s play. You will also find the Tone button, which enables the automatic pitch correction. Harmony-G XT offers 10 presets, which are divided into two banks (A and B). You can easily choose the bank with the preset button and then scroll through the presets using the footswitch. There are also two harmony voicings with 6 variations, with 5 of them (higher, high, low, lower, bass) being the same and different 6th option: Voice 1 goes up an octave, while the Voice 2 goes down an octave. The great addition to all these features is the guitar tuner, that is activated by pressing and holding the second footswitch. The settings can be switched using the left footswitch, while the right one also lets you to switch between harmony and doubling effects and add some more on top. As you can see, Harmony-G XT is a badass pedal, that offers an abundance of effects and an array of tone shaping possibilities. And we are back to the TC family. 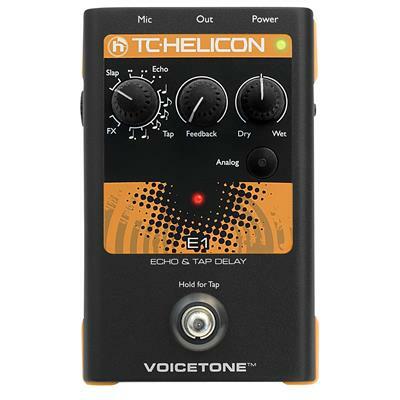 VoiceTone E1 is probably the simplest pedal out of the ones we have reviewed in this article. However, it still packs a reasonable amount of features and provides you with a great deal of versatility. Let’s jump right into the subject and figure out what each control does. VoiceTone E1 offers 12 different echo and delay effects, including slap echoes, tap delays, echo FX and filtered delay. You can choose between them using the first knob on the surface. Then comes the Feedback, which allows you to set the parameters of the said effects. Dry/Wet knob mixes the affected signal with the original and maintains the definition of your sound. The selling point for this bad boy is probably the Analog button, because there is nothing more attractive than good ol’ vintage delay. There are Mix Control and Mic Gain knobs on the sides of the pedal as well. This unit can be paired with other pedals from the VoiceTone Singles series, which will allow you to mix up several delays. It is true, though, that you cannot save presets with E1, however, this can easily be a pro for many musicians. In short, this is quite an amazing bang for the buck. What is a vocal processor and why would you need one? Vocal processor is an electronic device that adds effects to your vocals, perfects and equalizes its pitch or touches it up with harmonies. It is basically a studio quality tone shaping in the form of a stompbox or a rackmount unit. A good vocal processor can make you sound like a real professional and make sure that nothing is out of tune (if that is not what you are looking for). Many purists might try to convince you that using a vocal processor is cheating and you do not have the right to utilize it. However, they are wrong. Pitch perfection is something even the best vocalists will use in certain scenarios. No matter how good you sound, sometimes you need more reliability, which this unit can provide (this does not mean that if you have ethereal vocal capabilities, you still have to buy this unit). Plus, not everybody wants to merely rely on pristine vocals. Many musicians employ effects as part of their performance, which, more often than not, defines their genre. A vocal processor will allow you to sound like a male/female, a robot or an old radio, almost anything you could think of. This gives you a great deal of versatility and opens up the doors of sonic possibilities. Modern music is quite accepting as it embraces experimentation and innovation. That is why you should alter your vocals the way you want. A vocal processor makes that process a lot easier and delivers opportunities in a small metal chassis. What is more, no matter how good your mic is, it might still change your sound a bit. Sometimes, these changes are so significant that the overall performance is ruined. In order to avoid such detrimental turn of events, many musicians employ vocal processors as preamps. They can make sure that your vocals are not ruined, but rather enhanced and improved. They do not let your sound get lost in the mix, amplify the inaudible parts and tone down the louder ones. Out of all the opportunities that a vocal processor can provide, the one that stands out the most is the ability for solo performers to sound like a band. This is a great opportunity especially if you want to be the star yourself. This unit will add the background vocals, let your instrument sound different for each and every song and emulate almost any sound possible. If you are a solo performer, you should definitely try playing with this device. After all, spending money on a vocal processor is a small price to pay for the results you can achieve. Just go for it and turn the potential of your music into a masterpiece that will change the world! Whether you are a guitarist or a singer, you probably already know how important the details are when it comes to electronic devices. Even the most “insignificant” feature might define the overall performance of the device. Thus, there are certain parameters that a vocal processor should satisfy in order to hold the name of the best on the market. 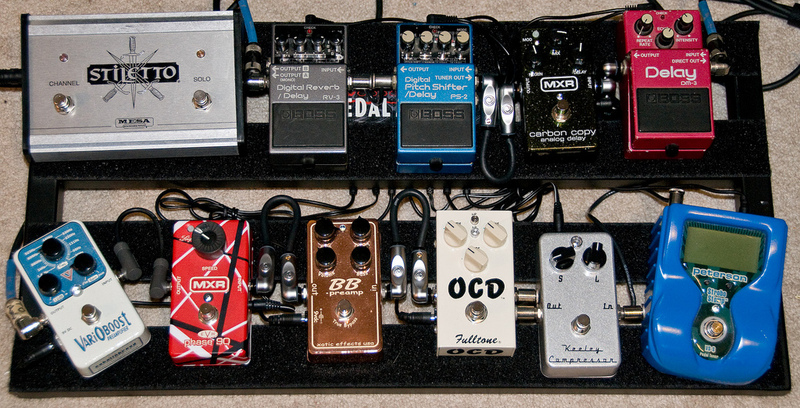 Let’s discuss some of them and figure out, what are your must-haves when it comes to the pedals of this ilk. As we have discussed above, pitch correction might be the very reason why you will consider purchasing a vocal processor. This feature perfects your vocals and balances out any uneven parts. The resulting sound is way more uniform and professional, which is what most of us are going for. Plus, sometimes your voice does not want to come out perfect regardless of your capabilities. One way or another, pitch correction is very helpful feature to have on hand no matter where you perform (on stage or in the studio). Now, for the performance to be complete, your guitar and your vocals should always be in sync with each other. A vocal processor can achieve this easily if it has the ability to “read” the harmonies of your instrument and shape your vocals accordingly. This way the overall sound will be perfect (no exaggeration, I promise) and extremely tailored. Let’s start with the looper. This feature allows you to record your voice, overdub and play it while you sing another part. This adds a significant amount of richness to your sound and touches it up with uniqueness. Looper is a great option if you want to be different and stand out among other performers. Now, whether you have the looper or not, it is always a good option to have presets on hand. The ability to record your voice or just remember your favorite settings makes it easier to perform on stage and find that perfect spot in a blink of an eye. Nobody wants to spend ages on tweaking before the gig. A preset will be a perfect solution to that issue. The majority of the vocal processors are also multi-effects pedals. They offer an abundance of vocal effects, including different types of delays, echoes, reverbs and even distortions. This once again adds up to the versatility and allows you to sound different every time. The best vocal processor should have this feature, otherwise, it will be difficult for it to compete with its rivals. Whether it is a vocal processor or any other effects pedal, you should always be able to shape your tone to your preferences. Be it your own voice or the effects, it is a good option to modify different parameters of it. This means that even the simplest vocal processor should have the Level knob. This will set the volume of the unit and make sure that the overall output is even. What is more, a Blend knob will be your lifesaver if you use a lot of vocal effects. It will mix up your dry and wet signals and let your original sound stand out. Last but not least, there is no such thing as unnecessary EQ. If you are meticulous about your voice, you will need all three of these in your vocal processor. We have successfully gone ventured in the world of vocal processors. We have discussed some of the best deals out there and outlined their advantages and drawbacks. We have also emphasized all the qualities the best vocal processor should possess and dived into some important technicalities. Hopefully, this was enough to understand this device to its core and grasp what to do with it. I tried my best to provide you with all the information you will need without boring you out too much. My journey ends here. The rest is yours to decide. Do not be afraid to experiment with your voice and do not let anyone dictate how you should sound. You are one and only king of your vocals and rest of us have no say in the matter. Go out there, grab the pedal of your dreams and let the wonderful possibilities fill your soul with uniqueness. Good luck!